The new Online Data Logger from AWE Instruments is a revolution in data logging. Data from your process instrument, visible instantly, from your phone, tablet, or computer anywhere in the world. All historic and current data is stored online, in an open format, so you can import it into your spreadsheet software. Or generate a Chart online and download it straight to your device. Our 'Data First' approach means there is no proprietary software to be installed. Just login to access your data - it is yours after all. 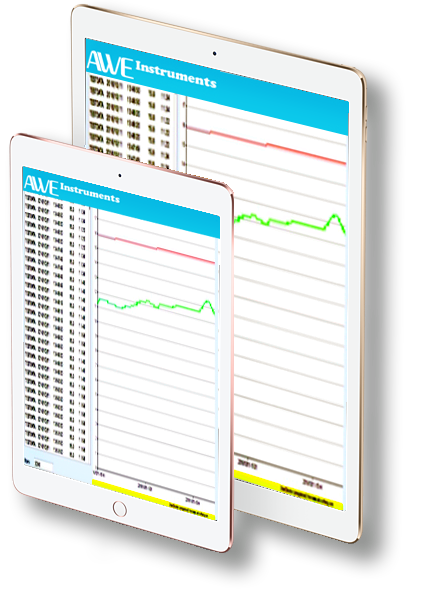 The AWE Instruments Online Data Logger allows you to connect any of our instruments to the device. The in-built modem connects to the AWE Online Portal and uploads your data using any of the available mobile network providers. There's no need to integrate to an existing network - the Online Data Logger is a stand alone device. Our 'data first' approach allows the AWE Instruments Online Data Logger to work with multiple parameters. Up to 12 sensors with isolated outputs, or 12 sensor and instrument combinations, can be logged from one Online Data Logger. For more information on the sensors, and sensor & instrument combinations we've worked with click the read more link below. All that is required is an internet connected smart phone, tablet, or computer - your data is accessible from anywhere. The online data is available from the secure cloud 24 hours a day 7 days a week, with an adjustable upload cycle starting from every 6 minutes. 100% of your data, 100% of the time, in a format that suits you.